for Arts at the Armory. Come join us at the armory as we tune into the Berklee School of Music for an evening of music and grassroots activism. Cash bar and snacks will be available. 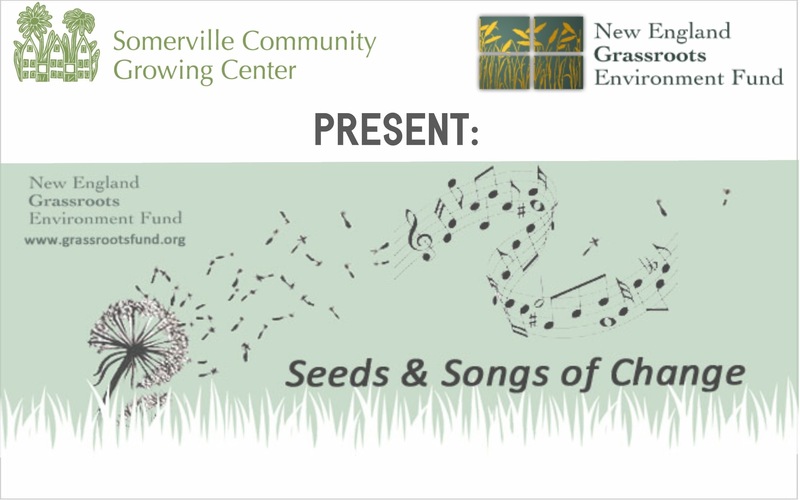 Seeds & Songs of Change is an intergenerational musical event and benefit concert to celebrate the power of grassroots activism featuring live performances, entertaining music videos and testimonials. Narrated by NPR’s Steve Curwood, the event will feature folk icon Noel Paul Stookey of Peter, Paul and Mary and local musician, Tem Blessed, with his band. The primary purpose of this event is to say thank you to people, grassroots volunteers, who work to better their communities. NEGEF will be announcing the creation of a Legacy Fund to honor founding director, Cheryl King Fischer’s 18 years of leadership. The Somerville Community Growing Center and NEGEF have a long history together. Being one of the earliest funders of the Growing Center, NEGEF has not only provided us with grants, but also with a tremendous amount of knowledge, training, and skills building. We would like to give a big thanks to NEGEF for promoting grassroots work across New England and right here at the Growing Center. Please join us for this wonderful celebration at the Center for Arts at the Armory ( 191 Highland Ave. ) on November 15th from 6pm – 9pm.